Well, it's been a while since I left off on this series of posts. Considering how bad "Space Rockers" and "Bucks' Duel To The Death" were, I had almost abandoned it. But really, with one more two-hour season finale to go to finish Season One I had to see it through. In the past, this series featured recycled "Batman" villians The Riddler and The Joker. 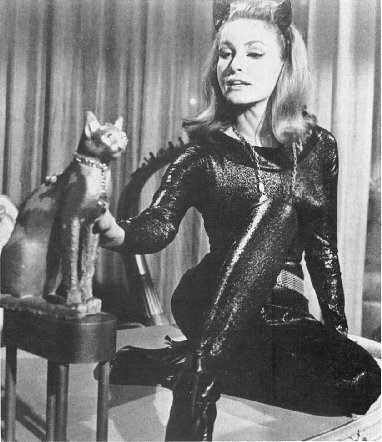 This time around, our favorite Catwoman, Julie Newmar, is featured. Now back in the Sixties, seeing Ms. Newmar strutting around in that tight catsuit was something to behold. This is why we call it "gratuitous". Buck and company travel through a space warp, which is like a wormhole but similar to the star gates. I guess. With me so far? They end up in a different universe. But you can't have a season finale without Princess Ardala. So the good ship "Draconia" follows them with thoughts of conquest. 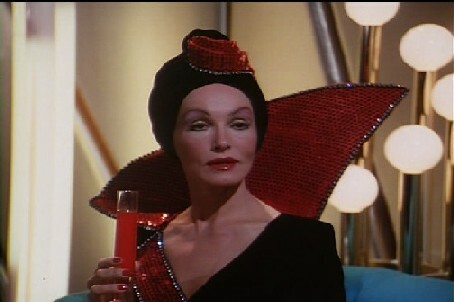 That's right, Pamela Hensley returns for her final appearance as the Draconian Princess. They end up coming to the aid of the planet Pendar which is being attacked by the forces of the War Witch. Now Zarina isn't really a "witch". She's more of a ruthless leader of a neighboring empire. Buck and the Princess agree to a temporary truce to save Pendar and figure out a way back to their own universe. Why? Well, because Buck asks Ardala really nicely. Actually, at first Ardala's cooperation is a ruse but her attempts to ally with Zarina fail. There's only room enough for one drama queen in this universe. Newmar is very cool and distant as Zarina but honestly if you told me she spent the whole time on the set doped up with Valium I wouldn't be all that surprised. She was more of a zombie than a Catwoman. But she gets a pass for having the kind of beauty that was reminiscent of the golden age of Hollywood, so much so that she became the object of adoration by three drag queens in the 1995 film "To Wong Foo, Thanks For Everything! Julie Newmar". You have to see the movie to understand the title. It's definitely interesting, right up to the memorable "I am Spartacus" moment at the end. Anyway, needless to say Zarina is defeated, Pendar is liberated and every one goes home happy. But not before Ardala makes one last attempt to woo Buck. Of course, Buck declines and while the Season ends with the idea that may see Ardala again, we never will. Interestingly enough, by this time Erin Gray had convinced the show's producers to let her go back to her natural hair color - dark brown. In the second season, she'll look like this. Something to look forward to. Unfortunately for the fans, this was about all there was to look forward to. Season Two was delayed by an actor's strike that fall and while the writers were sitting around doing nothing much else they decided to take the show in a different direction. There were thirteen episodes filmed and broadcast from January through April of 1981 - most of them were worse than any of the ones I designated as "pass" in season one. Next up: I could write a whole post on what went wrong with Season Two. In fact that's what I plan on doing rather than focus on giving overviews of specific episodes. Keep an eye out for it. The first post in this series can be found here.